Kenya’s first president Jomo Kenyatta (his name means the light of KEnya) wore endangered species skins and carried an ivory walking stick). Like Presidents Moi and Kibaki after him, he showed little concern for the environment and wildlife and left a legacy of destruction. His own direct relatives engaged in the ivory and rhino horn trade leading to the collapse of Kenyas herds. Frankly the British didn’t do much good either – they started the whole concept of killing animals and destroying our forests. Grrrrr…..
Interestingly the post election violence that rocked Kenya in 2007 elections saw 1,500 killed, vs less well reported 2000 who are reported to have been killed in 1992 elections. Evidence of some of the earliest human settlements has been found in Kenya, suggesting that it was the cradle of humanity from which descendents moved out to populate the world. 600 – Arabs begin settling coastal areas, over the centuries developing trading stations which facilitated contact with the Arab world, Persia and India. 16th century – Portuguese try to establish foothold on Kenyan coast but are driven off by Swahili states and Omani Arabs by late 17th century. 1830s – Omani Arabs consolidate control of coast. 1895 – Formation of British East African Protectorate. Early 1900s – White settlers move into highlands, railway built from Mombasa to Lake Victoria. 1920 – East African Protectorate becomes crown colony of Kenya – administered by a British governor. 1944 – Kenyan African Union (KAU) formed to campaign for African independence. First African appointment to legislative council. 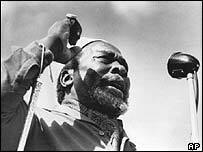 1947 – Jomo Kenyatta becomes KAU leader. 1952 – Secret Kikuyu guerrilla group known as Mau Mau begins violent campaign against white settlers. State of emergency declared. Kenyatta arrested. 1953 – Kenyatta charged with management of Mau Mau and jailed. KAU banned. 1956 – Mau Mau rebellion put down after thousands killed – mainly Africans. 1959 – Kenyatta released from jail but under house arrest. 1960 – State of emergency ends. Britain announces plans to prepare Kenya for majority African rule. Kenya African national Union (Kanu) formed by Tom Mboya and Oginga Odinga. 1961 – Kenyatta freed and assumes presidency of Kanu. 1963 – Kenya gains independence, with Kenyatta as prime minister. 1964 – Republic of Kenya formed. Kenyatta becomes president and Odinga vice-president. 1966 – Odinga, a Luo, leaves Kanu after ideological split, forms rival Kenya People’s Union (KPU). 1969 – Assassination of government minister Tom Mboya sparks ethnic unrest. KPU banned and Odinga arrested. Kanu only party to contest elections. 1978 – Kenyatta dies in office, succeeded by Vice-President Daniel arap Moi. 1982 June – Kenya officially declared a one-party state by National Assembly. 1982 August – Army suppresses air force coup attempt. Private Hezekiah Ochuka rules for about six hours. 1987 – Opposition groups suppressed. International criticism of political arrests and human rights abuses. 1989 – Political prisoners freed. 1990 – Death of the foreign minister, Robert Ouko, in suspicious circumstances leads to increased dissent against government. 1991 August – Forum for the Restoration of Democracy (Ford) formed by six opposition leaders, including Oginga Odinga. Party outlawed and members arrested. Creditors suspend aid to Kenya amid fierce international condemnation. 1991 December – Special conference of Kanu agrees to introduce a multi-party political system. 1992 – Approximately 2,000 people killed in tribal conflict in the west of the country. 1992 August – Ford splits into two factions – Ford-Asili (led by ex-government minister Kenneth Matiba) and Ford-Kenya (led by Odinga). 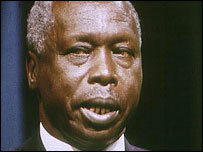 1992 December – Moi re-elected in multi-party elections. Kanu wins strong majority. 1994 – Odinga dies. Opposition groups form coalition – the United National Democratic Alliance – but it is plagued by disagreements. 1995 – New opposition party – Safina – launched by palaeontologist Richard Leakey. Party refused official registration until November 1997. 1997 – Demonstrations calling for democratic reform. World Bank withholds disbursement of $5bn in structural adjustment credit. 1997 December – Moi wins further term in widely-criticised elections. His main opponents are former vice-president Mwai Kibaki and Raila Odinga, son of Oginga Odinga. 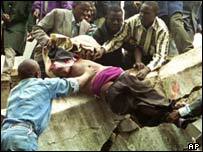 1998 August – Bomb explodes at US embassy in Nairobi, killing 224 people and injuring thousands. 1999 – Moi appoints Richard Leakey to head government drive against corruption. 2001 April – Leakey appears in court to face charges of abuse of power and perverting the course of justice. 2001 June – Parliament passes a law allowing the import and manufacture of cheap copies of anti-Aids drugs. 2001 – Ethnic tensions culminate in several violent clashes. In December thousands flee and several people are killed in rent battles involving Nubian and Luo communities in Nairobi’s Kibera slum district. 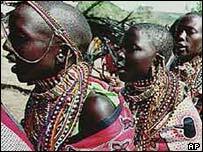 2002 July – Some 200 Maasai and Samburu tribespeople accept more than $7m in compensation from the British Ministry of Defence. The tribespeople had been bereaved or maimed by British Army explosives left on their land over the last 50 years. 2002 November – 10 Kenyans, three Israelis are killed when an Israeli-owned hotel near Mombasa is blown up by a car bomb. A simultaneous rocket attack on an Israeli airliner fails. A statement – purportedly from al-Qaeda – claims responsibility. 2002 December – Opposition presidential candidate Mwai Kibaki wins a landslide victory over Kanu rival Uhuru Kenyatta, ending Daniel arap Moi’s 24-year rule and Kanu’s four decades in power. 2003 January – Government bill proposes anti-corruption commission. Moi critic John Githongo appointed anti-graft czar. 2003 November – International Monetary Fund (IMF) resumes lending after three-year gap, citing anti-corruption measures. 2003 December – Government decides to grant former president Daniel arap Moi immunity from prosecution on corruption charges. 2004 March-July – Long-awaited draft of new constitution completed. Document requires parliament’s approval and proposes curbing president’s powers and creating post of prime minister. But deadline for enactment is missed. 2004 July-August – Food crisis, caused by crop failures and drought, dubbed “national disaster” by President Kibaki. UN launches aid appeal for vulnerable rural Kenyans. 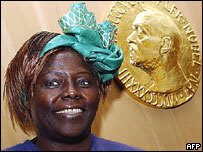 2004 October – Kenyan ecologist Wangari Maathai wins the Nobel Peace Prize. Controversy over jail conditions amid intense media coverage of inmate deaths at Meru jail in the east. 2005 January – Clashes over land and water rights leave more than 40 people dead. 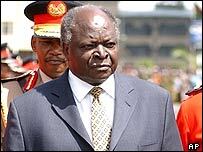 2005 February – Corruption takes centre stage when it is claimed that graft has cost Kenya $1bn under Kibaki. Leading anti-graft official John Githongo resigns. International donors voice unease. 2005 July – Raiders kill 76 villagers, most of them women and children, in the north-east. The massacre is blamed on a rival clan. Parliament approves a draft constitution after days of violent protests in Nairobi over aspects of the draft which demonstrators say give too much power to in the president’s hands. 2005 November-December – Voters reject a proposed new constitution in what is seen as a protest against President Kibaki. The president replaces his cabinet; some nominees reject their appointments. 2006 January – Government says four million people in the north need food aid because of a drought which the president calls a “national disaster”. 2006 January-February – Government ministers are linked to a corruption scandal involving contracts for a phantom company. One of them, Finance Minister David Mwiraria, resigns and says allegations against him are false. 2006 March – Armed police, acting on government orders, raid the offices and presses of the Standard group, one of Kenya’s leading media companies. 2006 April – Three days of national mourning are declared after an aircraft carrying several prominent politicians crashes in the north. 2006 April – Visiting Chinese President Hu Jintao signs a contract allowing China to prospect for oil off the Kenyan coast. His African tour has focused on trying to satisfy China’s hunger for energy and raw materials. 2006 October – UN says some 35,000 Somalis escaping drought, Islamist rule and looming conflict have arrived in Kenyan camps since early 2006. 2006 November – December – Regional flooding renders thousands homeless. Some 100,000 Somali refugees cut off by floodwaters in the north-east are supplied by air drops. 2007 May – A Kenya Airways plane with 114 people on board crashes in Cameroon. 2007 December – Presidential elections. President Kibaki claims victory and a second term in office, prompting a wave of unrest. Opposition says polls were rigged. Opposition Orange Democratic Movement (ODM) wins most seats in the parliamentary election. 2008 January – Post-election violence kills more than 1,500, including an MP. 2008 February – Former UN chief Koffi Annan brokers talks between President Kibaki and opposition leader Raila Odinga, which lead to signing of a power-sharing deal. 2008 April – Mr Kibaki and Mr Odinga agree cabinet list. The 40-member cabinet is Kenya’s largest and costliest ever. 2008 October – Report into post-election clashes calls for international tribunal to try those implicated in violence. Many political leaders are reluctant to implement the commission of inquiry’s recommendations, with some arguing that prosecutions could trigger further clashes between communities. 2008 December – Kenya Anti-Corruption Commission (KACC) accuses seven current and former MPs of taking illegal allowances worth $250,000. 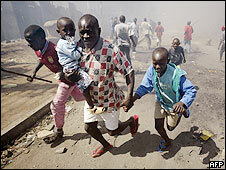 2009 July – Kenya’s cabinet announces that it will not set up a special tribunal over last year’s post-election violence, and will use local courts instead. 2009 August – Visiting US Secretary of State Hillary Clinton criticises Kenya for failing to investigate the deadly violence after the 2007 election. Kenya says that at least 10 million people, or one third of the population, are in need of food aid. The government mobilises the military to distribute food, water and medicines to areas hit hardest by drought. Moi, Kibaki and all the other uselesss politicans in this country have left us no choice but to replant the Mau ourselves. 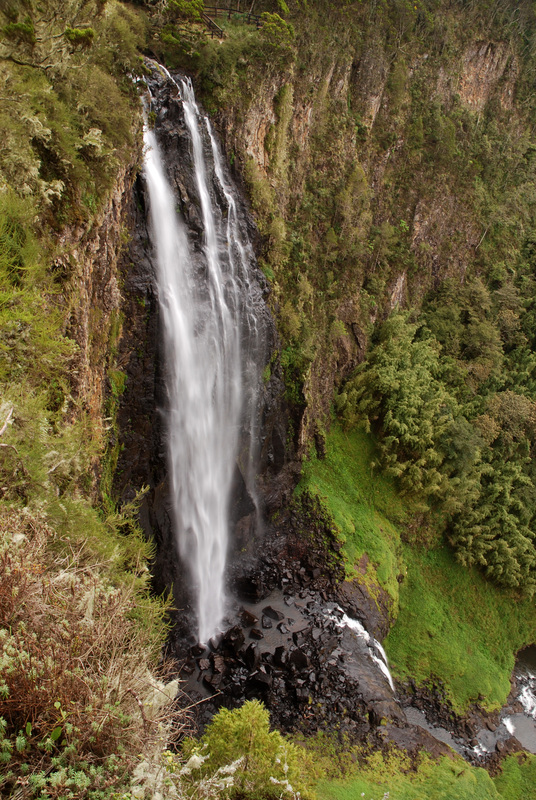 So, @kahenya (kahenya.com) and I are going on a wild expedition to Ogiek-land with Dr. Mukuria to learn about how we slept when the forest was destroyed, and to replant our own patch with indigenous trees ….and God Forbid anyone tries to chop them down. This is part of a lifetime commitment to repair this damaged country.